There are many things that can cause water seepage that provides a place for mold to grow. 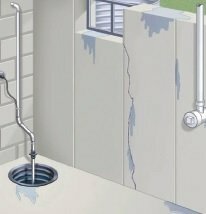 If you have high humidity, poor drainage, leaky pipes, blocked vents, or loose crawlspace doors, you may be prone to water damage. If you are suspicious of mold in your home, it is vital to get it inspected and removed immediately. The presence of mold is very hazardous to your health and can cause serious issues such as skin irritations and infections, asthma, allergies, organ damage, and cancer. When it comes to preventing mold and musty odors in your Richmond, Virginia home, Reliable Waterproofing & Masonry is here to help. We provide several waterproofing and drainage systems to keep your home safe and dry. The number one thing you can do to prevent mold growth and musty odors in your home is to keep water away. We can help you do this by installing interior and exterior waterproofing systems. Another good investment that you can make is in a dehumidifier. By having one of these in your basement, you can get rid of excess moisture and prevent musty odors caused by stagnant air and mold. Let Reliable Waterproofing & Masonry be your waterproofing specialists in Richmond, Virginia and surrounding areas. Our team of highly trained professionals would be glad to help you with all of your basement waterproofing and repair needs! Call us today for more information about the services that we offer.